One of my readers asked me about cultural differences in Thailand, from the perspective of a westerner staying in Thailand for an extended period. My reader who is I’m guessing a teenager, is going to be staying in Thailand for a year on an exchange program. Don Charisma: Well you are in for a treat, it’s warm, the food is great, the people are generally pretty happy … it’s quite green place plenty of trees and green areas … I was a little worried about various things before I came here, but I think most of it, I was just wrong about … did I cover everything ? You will often find that outsiders get charged higher prices for things, in anything apart from shopping malls. So be prepared for this. It’s impossible to stop it happening, the best advice I can give you is be polite, learn some pleasantries in Thai and use them. The Thai’s will like you a lot more if you smile, and try to speak a little of their language. Sawadeecarb means essentially “hello”, Cop-Khun-Carb means thankyou. For males, females have to say it differently – Sawadeecar for “Hello” and Cop-Khun-car for thankyou. Also you will rarely be able to return something if you don’t want it, it breaks or any other reason. ALWAYS THINK CAREFULLY before you put money into someone else’s had. Once you’ve given it, well good luck trying to get a refund ! I always carry small bills. I make a point of buying small things in 7-11 and keep on stocking up with change, do this in “respectable” places. It’s best to carry exact money for anything that your paying for. So my wallet will have lots of 20 baht and 100 baht notes, a few 500 baht and even fewer 1000 baht. I always save the 10 baht coins to use on the bus. When you arrive, start changing money into smaller sizes at your first opportunity. Why ? Well people can be tricky, give wrong change, not want to give you change if you pay large note and then hard to argue with them. If you give them the correct money, then harder for them to try and trick you. As for things that might offend well that’s a long topic, suggest some research into cultural differences and respect the Thai culture. There are many trashy people, but there are also a lot of good people who try to live with virtue. So be careful not to show anger in public, make sure you have a very good reason if you are. And then try to keep smiling, try to be patient and assertive. Getting angry with people could land you in mess. They are very very protective of the royal family. So I’d suggest don’t do or say anything disrespectful towards the royal family. My preference is to dress humbly, t-shirt and shorts (or jeans), often not new. I often carry a small backpack which is used and worn. Try to make yourself blend in, but not over the top with flowery shirts and “traditional” Thai dress. Just look like an ordinary, not very affluent westerner. Within that don’t be scruffy, still take care of your appearance, but the point is to look not that wealthy even if you are. The Thais are odd about public affection, so be cautious about body language and touching Thais in public. Also the head is the most sacred part of a Thais body, so again use caution touching Thais heads. 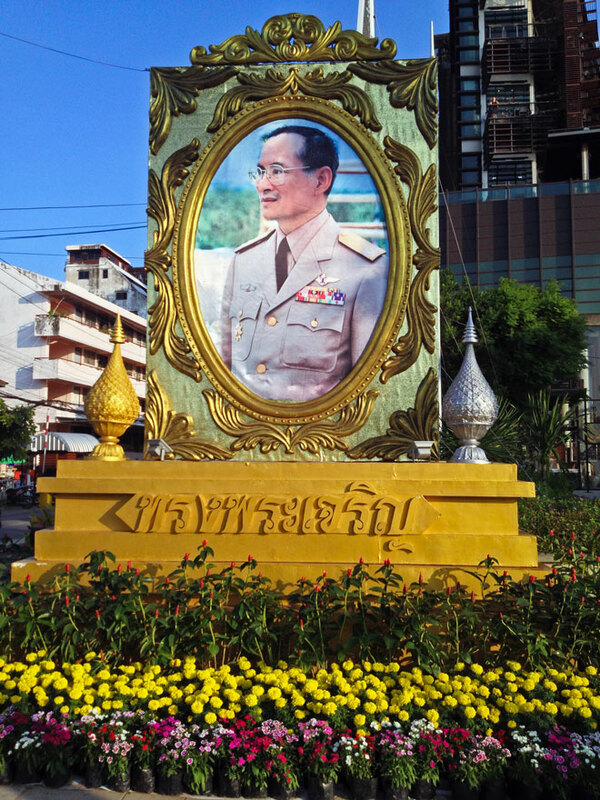 The above photo is the Thai king. As mentioned above, the royal family are held pretty much sacred – so DO NOT disrespect the royal family, you can be arrested, fined and/or jailed I think for doing so. Respect local laws and cultural differences and Thailand is an enjoyable fun place to visit. Obviously do your own research and due diligence elsewhere. Also note there are some political troubles currently in Bangkok, so worth informing yourself prior to travelling. Don’t take my word for it ! Great post. You covered everything very well here. Where in Thailand do you live? I’m in BKK. What an informative article, and I bet many people will find this post useful, whether traveling in Thailand or other places. Your emphasis on being respectful and observing local customs is a great idea. I bet your young friend makes good use of your hints. That he would ask is a measure of his respect for you and for the place he intends to visit. Thanks hun, I said to someone else, I wish that someone had told me all this before travelling … I probably have gleaned a little along the way from other decent people … I hope that my young friend will have a safe and pleasant stay … certainly I’ve left plenty to learn ! I just got back from Bhutan and the bit you mentioned about the royal family is so true for Bhutan too. In India, that level of love or dedication/loyalty to any leader is invariably condescended upon as sycophancy. In Bhutan though it didn’t seem like that at all. Cultural connotations are so fascinating. Thanks for this blog! What a fantastically written piece. Informative and tactile. Certainly useful for me when I travel there later in the year. Thanks! Very happy to be of service, I wished I’d had someone to tell me this ! I enjoyed this post Don. I enjoy learning about other cultures. I have strong past life ties with Asia. Years ago i went to China and recently I have been studying the South Korean culture, so I was curious how Thailand differs from these other 2 countries. Thanks for sharing. Buck Fuller said: “There are 2 ways to unravel… One is to dream and the other is to travel”! This is very insightful and wise… Thanks for sharing. I hope to visit myself one day. For sure, overprepared can be worse than being ill-prepared … so hard to win on that one ! You’ve answered some wonderings of mine. Thanks for the look inside, DC. These are great tips! I have so many so how awesome Thailand is, and I really want to go there. The head thing … that so much so. I’d never heard that before, and patted the head of a friend in public. She, though Thai, is a long-term friend that I met while she was living in the US, so she understood and had nothing wrong with it. The twenty or so Thais surrounding us, however, freaked the heck out! Yes, no one was mad at me for doing it, but the looks on their faces! Great tips Don..its my fav holiday destination! i just confirmed that U use iphone.. but whre do u keep it? I’d never considered visiting Thailand but after seeing your pictures I won’t turn down the opportunity if I get the chance. Thanks Phil, you should if you get the chance … had a chance to look into the instagram thing, and I can only upload photos from my mobile devices, so wouldn’t really work for me, as I edit eveything on my PC … I do listen to what people say to me ! I would say that Thailand is a very easy country to stay in for a while. I’m sure that there are issues and problems and as a long-term expat you get to see some of the rougher sides and get first-hand experience with some of the challenges, but it’s pretty smooth sailing. Leave a whitie somewhere on the African countryside and you got yourself an insane culture shock experience when everyday life kicks in. Thailand, not so much. I will never forget the despair I felt in certain parts of India. I honestly just wanted to sit down in the middle of the road and howl: “I wanna go hoooooooome!” Not for me, in other words. But I never, ever felt that way in Thailand.